KANSAS CITY, Mo. 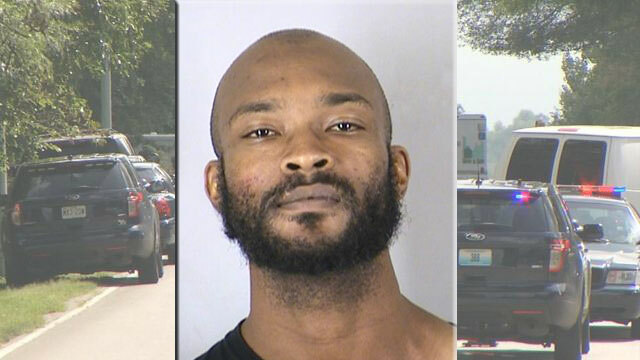 - A 34-year-old convicted felon with a history of violence is now facing charges in the fatal shooting of three people and critical wounding of two others in a Kansas City neighborhood. Brandon Howell is also charged in connection with an assault on hotel guests in the city. Prosecutors charged the 34-year-old Howell on Wednesday, one day after police say he fatally shot three people and critically wounded two others in quiet south Kansas City neighborhood. Eleven hours after the shooting, police found Howell walking along Interstate 29 near midnight with a loaded .12-gauge shotgun down his pants. Howell faces 12 felony charges in Jackson County, including three counts of first-degree murder, for the shooting deaths of Alice Hurst, 88; her son, Darrel Hurst, 63; and Susan Choucroun, 69. He also is accused of severely beating George and Anna Taylor, who remained in critical condition at a local hospital Wednesday, Jackson County prosecutor Jean Peters Baker said. He was also charged in Platte County with burglary, three counts of assault and other offenses related to three assaults at a Motel 6 in north Kansas City about two hours after the shootings. The shootings appeared to be random, Peters Baker said. Kansas City police responded to a 911 call from Anna Taylor at 12:50 p.m. Tuesday. Officers found Choucroun's body in the driveway of one of the homes in this tidy, middle-class cul-de-sac lined with duplexes. The Taylors were next door in their basement suffering from critical injuries, and a few houses away, the Hursts' bodies lay in the front yard. Witnesses told police they heard several shots and saw a beige Toyota Highlander stop in front of Choucroun's home and a man get out carrying a long gun, the probable cause statement said. Prosecutors said the man shot the woman, got back into the Toyota and drove away. Two hours later, police received a report that three people had been assaulted at a Motel 6 about 30 miles from the shooting scene. While canvassing the commercial area, officers found the stolen SUV in a restaurant parking lot near the motel. Kansas City was gripped by the news, as it appeared to be a random shooting spree. Schools near the motel were locked down and residents were urged to stay inside and lock their doors Tuesday evening as the search for the suspect continued. "This is not a crime spree," Baker said at a news conference. "This was an individual who committed heinous acts and he is going to pay for his acts." Howell is being held without bond in the Jackson County jail. Kansas court records show he was paroled in 2011 after a conviction for a home invasion in Johnson County, Kansas, in which one victim was cut on the hand and a cat was killed. Peters Baker said the shotgun Howell had at the time of his arrest Tuesday was the same one he bought in January 2000, eight months before pleading guilty to several charges in the 1999 home invasion and was sentenced to 12 years in prison. Howell also was acquitted in 2009 in the killings of two Kansas teenagers who were last seen in 1998. One victim's body was later found buried outside a Kansas City home being renovated by Howell's father; the other body has never been found.